When today's kids grow up, they will no doubt mock our penchant for pocket screens. VR and AR could be the new normal. 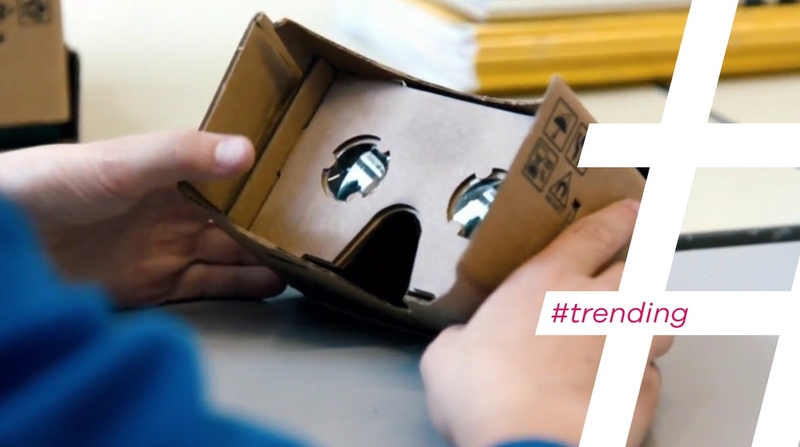 In this week's Trending we're looking at the wave of new schemes bringing virtual reality and augmented reality into the classroom as a tool for students. Oculus and Jaunt just started working with universities to offer classes on VR filmmaking. Google has been extremely vocal about bringing VR into the classroom, while Microsofts HoloLens has shown off augmented reality demos for college anatomy classes. Here's the ideas tearing up tech classrooms as well as who needs to go back to the chalkboard. Google Cardboard is a slam dunk as the best option for students. It's portable, accessible and easy to use, plus every kid probably has a smartphone these days. Cardboard can even become a fun - almost free! - project to make since Google provides the instructions with links to get affordable lenses and velcro pieces online. It's like it was made for the classroom. If that's assuming too much about smartphone availability and purchasing materials, teachers can sign up for the Expeditions Pioneer Program, which was announced last year, and have a Google team visit with Cardboard kits. The program hasn't reached every US state or country yet, but it's slowly making it's way. Half a million students have been on Expeditions so far and new virtual trips include a peek inside the State Rooms of Buckingham Palace and the UK government's new Expedition to 'visit' refugee children in Syria and Lebanon. VRARschool goes beyond Google's VR field trips and actually wants to teach high school classes. Specifically, the idea is to offer over 50 VR lessons on various subjects, starting with physics, to help students in the UK better visualise and understand their lessons. It's not really a model to replace school, rather its purpose is to aid teachers and supplement learning. It's certainly a neat concept that could get kids excited about "going" to school and plans are to support all the mainstream VR headsets but the project is still in very early days on Kickstarter. The founder, Ishai Jacob, has been teaching and tutoring for over 20 years and plans to make the program available in September 2016 if it reaches its £50,000 funding goal. Then it's a matter of getting schools, homeschooled pupils and tutoring programs to sign up for the subscription of £50 for a year for one device and £1,250 for up to 2,000 devices. Now the real question - what's the excuse for turning up late to VR school? We've seen many demos for Microsoft HoloLens - Minecraft, Halo, architecture and again, anatomy classes with Case Western University. In reality, the experiences are nothing like the concept demos. So in the video above, there'd be no beating heart in the middle of a room - rather you'd see a corner of a giant heart or just a tiny heart altogether because the FOV is about the size of an iPhone 5S. HoloLens is still a work in progress, of course, but the world of AR has always been plagued with minuscule FOVs that don't really allow you to see much, let alone study detailed anatomy. This is extremely expensive hardware and augmented reality comes into its own when you can overlay digital graphics over something real - an ancient ruin, say, or the night's sky.